Long before I started to make cards, I used to paint. My favourite medium was pastels but I had a go at everything. Consequently, my craft room is a bit of an Aladdin's cave holding just about everything except ... I was going to say "the kitchen sink" - but it has one of those too! I was inspired today by a tutorial posted by Melanie Muenchinger, about creating a sketchbook look with stamps, to get out my old pastel crayons and combine them with the Birthday Blooms stamp set. 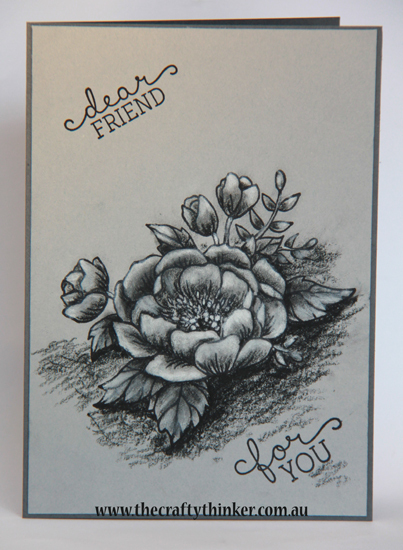 I stamped with Archival Basic Black ink onto Smoky Slate cardstock and then used the black and the white pastels to colour the flower and create a background and shadow for it. It was a bit of a messy process because I have always liked to smudge/blend pastels with my fingers! Once I'd erased all my fingerprints and washed my hands I gave it a spray with fixative before I adhered it to the front of the Basic Gray card. Soft pencils, charcoal, watercolour pencils or crayons would also work for this effect. I'm currently working on a watercolour version, using inks, that I'll show you (if it works!) next week. I hope you like this one - I really loved making it! Click on a product image to go directly to my online store.